Open Letter To President Barack Obama July 8,2016 | Contact us at 202-246-4924 or info@positivechangepc.com! Environmental Workforce Development and Job Training (EPA). The National Museum of American History (NMAH) provides experiential learning internships in a variety of fields (i.e., public relations, exhibition research, and project design). Interns learn from knowledgeable mentors and are exposed to enrichment activities ranging from behind-the-scenes collection tours, career readiness workshops, director’s talks, and field trips. The deadline for submitting applications is July 1, 2018 for both summer and fall internships. NMAH Internship Program – http://americanhistory.si.edu/getinvolved/internship. This selection is for all other internship projects outside of External Affairs and Communications & Marketing (i.e., Curatorial Projects; Archives Center; Conservation; Public Programs – Daily Programs, Programs in African American History, Programs in Latino History; Graphic Production; Exhibition Design and more!). The central Smithsonian Office of Fellowships and Internships (www.smithsonianofi.com) has paid internship opportunities that students can apply to and receive funding while being placed with a project at the NMAH. Go to www.smithsonianofi.com for deadlines and other information. 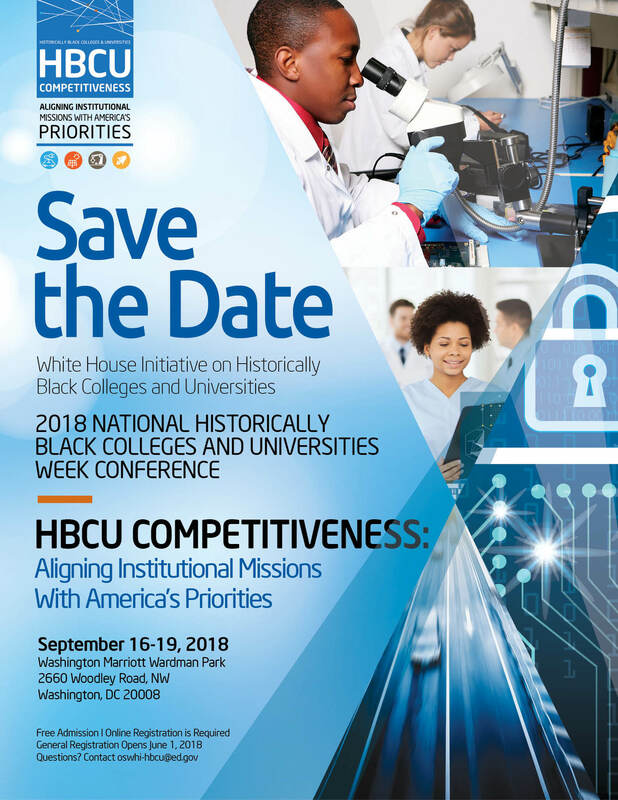 If HBCUs are interested in organizing an informational session with the NMAH, please contact: NMAHintern@si.edu. Projected US renewables could accelerate power price volatility — what can grid operators do? DEEP DIVEIt will take a renewables-friendly grid and grid-friendly renewables to keep markets flowing. New forecasts say the high penetrations of renewables coming onto the U.S. power system by 2030 could accelerate recent isolated instances of negative and spiking prices in wholesale markets. Research from Lawrence Berkeley National Laboratory (LBNL) shows higher renewables penetrations could cause these supply-demand imbalances more frequently, imposing instability in power markets. If this growth pattern continues, as many expect it will, grid operators and renewables developers will need to act to neutralize price volatility by making the electric power system more flexible, the LBNL researchers reported. As more solar and wind power comes online, renewables penetrations are reaching unprecedented levels in some places. On March 31, wind momentarily reached a North American record of over 62% of Southwest Power Pool (SPP) generation. On April 28, renewables met 72.7% of demand for the California Independent System Operator (CAISO). While the numbers are much smaller nationally, broader indications show unremitting growth of variable renewable energy (VRE). Grid operators are implementing a variety of steps to integrate that new capacity while minimizing adverse impacts on the system. 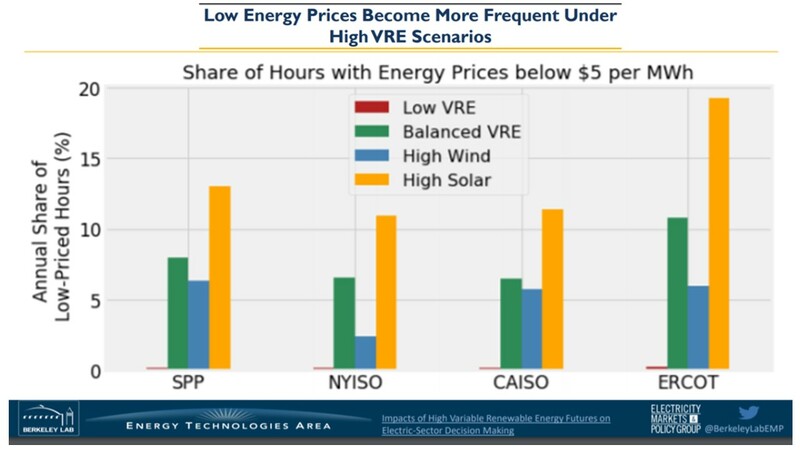 VRE penetrations of 40% or more would drive down average annual hourly wholesale energy prices “by $5/MWh to $16/MWh depending on the region and mix of wind and solar,” LBNL reported. The price impact is much greater at times of wind or solar overgeneration, the modeling found. Ten years ago, U.S. National Renewable Energy Laboratory (NREL) researchers first saw rising renewables penetrations. Like today’s researchers, they were concerned. That concern led them to discover new system operations that have kept then-predicted price volatility in check and transformed the threat into today’s renewables boom. It can happen again, LBNL Research Scientist Ryan Wiser told Utility Dive. 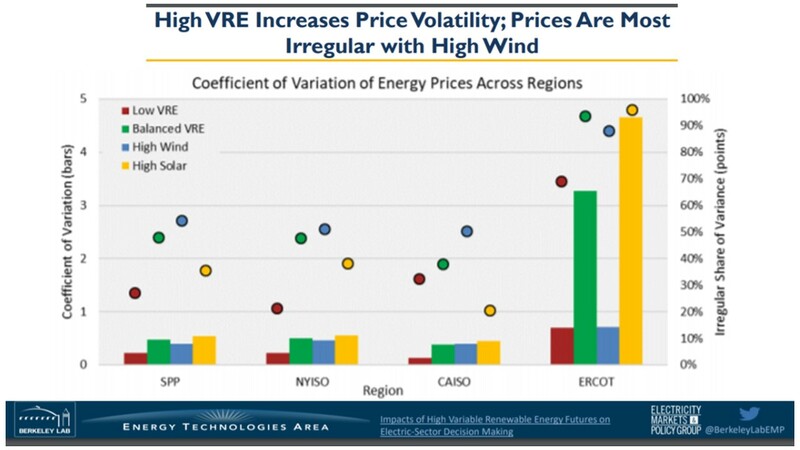 The research shows high VRE penetrations can make future price patterns “meaningfully different,” said LBNL’s Wiser, lead author of the new report. Current penetrations of VRE have led to very little of the recent price volatility, Wiser told Utility Dive. Previous LBNL work showed “about 90% to 95% of the explanatory factors for the average annual wholesale price decline of about $0.04/kWh between 2008 and 2016 was driven by the decline in natural gas prices,” he said. There was also “no observable widespread impact of VRE on thermal plant retirements,” he added. Instead, “plant characteristics” forced the closures seen over the last decade. Curtailment occurs when grid operators shut down renewables generation in response to negative prices and oversupply on their systems. Total price volatility was greatest in LBNL’s high solar scenarios, but the greatest irregularity in prices was in the high wind scenarios. In all high VRE scenarios, the system peak demand periods remain, but they tend to be pushed to later in the evening, especially in the high solar scenarios. 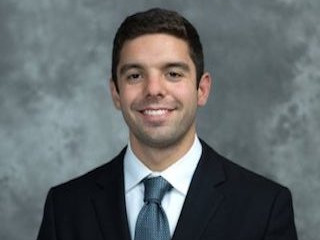 Negative pricing and curtailment have historically been found where transmission constraints prevented alleviation of local overgeneration, Wiser said. A system with more transmission capacity or operating procedures “friendlier” to high VRE penetrations could avoid the consequences described by LBNL’s modeling, he said. Another set of possible solutions would be to make VRE friendlier to systems, he added. A solar-friendly wholesale electricity system would have smooth, multi-hour time ramps rather than the short, steep demand spikes caused by midday solar overgeneration, LBNL research scientist and paper co-author Andrew Mills emailed Utility Dive. It would also have large balancing areas, or collaboration between balancing areas, to smooth momentary production fluctuations. Flexible generation that can be turned off and on multiple times a day could reduce overgeneration, he added. Well-crafted rate designs would give customers price signals that align demand with supply. System-friendly PV could do some of the same things, Mills said. Utility-scale projects could be sited and located strategically to prevent overloading circuits, protect against momentary output disruptions and produce when demand is higher, he said. Utility-scale projects can provide more services to the system operators if they are equipped with smart inverters, active power controls and on-site storage, he added. These are the kinds of strategies CAISO is working toward, according to Senior Public Information Officer Steven Greenlee. At the most basic level, system-friendly resources respond to negative prices by reducing output, he emailed Utility Dive. 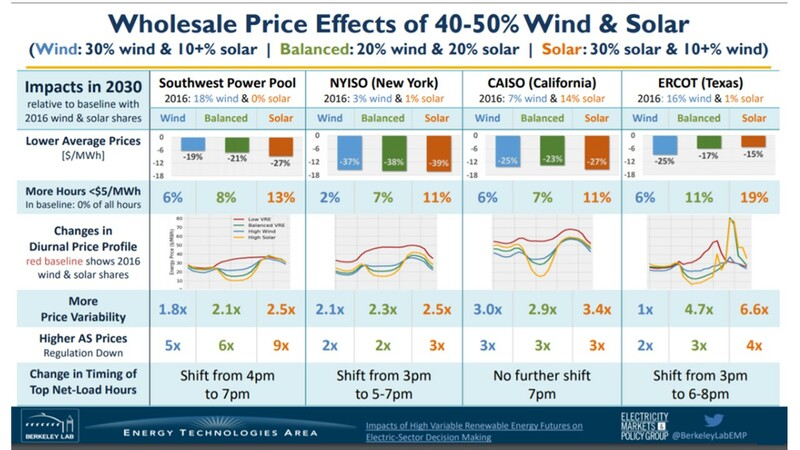 In addition, CAISO is working with the California Public Utilities Commission on time-of-use rates that will provide the kind of price signals Mills described. Other CAISO initiatives are aimed at lowering barriers to the integration and market participation of DER and energy storage. Both will make the system more flexible, Greenlee added. Turbines with taller towers, larger rotors, and advanced capabilities can make wind system-friendly by bringing the levelized cost down and providing system balancing, according to an October 2017 International Energy Agency study. Other system-friendly things wind developers can do include optimizing siting and expanding siting diversity, LBNL reported. Integrating storage and other power electronics can allow a project to provide grid services, LBNL also reported. The system can be friendlier to wind if it has more generation flexibility and more available transmission capacity, LBNL added. It can offer more flexibility with advanced operational and market practices. SPP’s 2017 State of the SPP Market report highlights two key opportunities to enhance the flexibility of the system by changes in the way wind generators participate in the SPP market, he said. One change is to require non-dispatchable renewables, and especially wind, to become dispatchable through a system-friendly change in reporting, Collins said. “Dispatchable resources provide a forecasted level of production and a price at which they will curtail output,” Collins said. “Non-dispatchable wind resources do not provide a price. This creates market inefficiencies that contribute to negative pricing as well as operational issues, Collins said. SPP’s report also describes a concern with under-scheduling by wind producers in the Day-Ahead market, he added. It is the main reason there is almost twice the negative prices in the Real-Time market. NREL Principal Analyst Paul Denholm led some of the earliest work on the challenges associated with renewables overgeneration in 2008. His 2015 NREL work identified early system-friendly and renewables-friendly strategies aimed at adding power system flexibility. Many long-lasting decisions about the power system “assume a business-as-usual future with low shares of VRE.” But a “high VRE future” can lead to “profound changes in wholesale electricity price patterns,” such as extreme price drops and spikes, according to LBNL’s report. When generation oversupply forces project owners to bid into markets at their own cost, just to keep generating, it can cause power prices to plunge below $0/MWh. Additionally, power prices spike to untenable highs when demand peaks in supply-constrained localized areas. In May, renewables served an average of almost 36.1% of the CAISO load, up from 2016’s 21%, with solar providing about 52% of the renewable generation and wind about 29%. Wind was 20.2% of total SPP system capacity at the end of 2017, up from 2016’s 19%. The 2017 wind generation capacity on the Electric Reliability Council of Texas system was 19.6%, up from 2016’s 13%. Even New York’s tiny 4% was a 25% increase on 2016’s 3%. Of the total 24,614 MW of new U.S, generating capacity in 2017, wind’s 6,881 MW accounted for 27.9%, and solar’s 4,853 MW added another 19.7%, according to Federal Energy Regulatory Commission data. That made VRE the single biggest source of new U.S. generation capacity in 2017. The LBNL researchers modeled four 2030 VRE scenarios. One was a business-as-usual scenario with today’s VRE penetrations, and one was a “balanced” 20% wind-20% solar scenario. The other two scenarios had either 30% solar and 10% wind or 30% wind and 10% solar. Sprint announced it is working on Mobi, a self-driving charging unit for electric vehicles (EVs) that can autonomously drive to vehicles when needed. Testing will begin in New York City at the beginning of 2019. The robots would rely on Sprint’s 5G network and advanced internet of things (IoT) technology for a micro-positioning navigation system, which the company says is more accurate than GPS. Mobi would charge with solar power and store power on lithium ion batteries to reduce their climate impact. New York City has a goal of electrifying 20% of its vehicle fleet by 2025, part of its overall effort to meet the goals of the United Nations’ Paris climate change agreement. Sprint says the Mobi project can advance that goal by removing one of the major barriers to electric vehicle use: charging. Rather than having cars, buses or other vehicles backed up at individual chargers, the robot would be able to circulate around parking lots and charge vehicles as needed. And while the state has invested in EV chargers, allowing more vehicles to juice up without relying on installation of chargers would help speed up the growth of EV purchases. Getting the robots from the testing stage to reality depends on a confluence of new technologies: 5G networks, IoT technology installation, connected vehicles, autonomous vehicle technology and fast charging. New York City is one of Sprint’s early markets for the 5G rollout, which will begin in the first half of 2019, but the network will need to be up to fully utilize Mobi’s positioning and vehicle finding (the micro-positioning system will also help the robots avoid obstacles and ensure safety). To study this, Danish university researchers sent undercover shoppers to visit 82 car dealerships in Denmark, Finland, Iceland, Norway and Sweden. Buyers were asked to remain neutral with no initial inclination toward any type of vehicle. Over the course of 126 car-shopping encounters, the researchers quantified sellers’ interactions with the buyers. They found that salespeople tended to systematically misinform shoppers about EVs, if not dismiss or ignore EVs entirely (77% of the time). In the minority of cases when EVs were mentioned, most steered buyers toward gasoline or diesel vehicles. Part of it was unfamiliarity: The researchers recorded conversations, and found that many sales staff lacked knowledge of electric drive technology. But deliberate misinformation was rife. “Do not buy this [EV] it will ruin you, it will ruin you financially,” said one quote from the sales process. “We have this electric vehicle [but] it only goes 80 km,” said another, falsely. EVs should reach price parity with conventional vehicles around 2025, and the economics should then change dramatically, since electric cars will then both cost less to make and operate. But as nations gear up for bans on internal combustion engines in the coming decades, and incentivize EV manufacturers with millions of dollars, they can’t forget about one of the most crucial steps: the point of sale. Tesla salespeople have been given shifting timelines for when the Powerwallhome battery will be available, current and former employees told Business Insider. Salespeople most often said they told customers they would receive their Powerwall in around six months, but customers were more likely to wait over a year for installation, current and former salespeople said. The company has failed to give salespeople a clear, consistent timeline for when the solar roof will be available, current and former salespeople said. These employees said they either were instructed or chose to avoid talking about the solar roof with customers. Tesla has sold customers on the idea that it is a one-stop-shop for transitioning toward clean energy. Between its electric vehicles, home charging units, solar panels, and home batteries, the company offers customers the opportunity to buy into an integrated system of products that can power their homes and cars with solar energy. But for two major pieces of that system — its Powerwall home battery and solar roof — the company has left its customers and salespeople wondering when the products will arrive, current and former Tesla employees told Business Insider. Business Insider spoke to one current employee and seven former employees who each left the company within the past two months. The current and former employees worked across five states: California, Nevada, Florida, Maryland, and Utah. Six were energy salespeople, one was a vehicle delivery person who also sold vehicles and energy products, and one handled administrative work for energy sales. Each requested anonymity for fear of reprisal from Tesla. In addition to providing uncertain delivery timelines, former salespeople said Tesla eliminated the commission they would receive for selling a Powerwall, which further decreased their desire to sell it. “We don’t have Powerwalls. We would get very, very small shipments in tiny, tiny increments. We had people waiting around for months and months and months,” a former sales manager said. The Powerwall is an important point of differentiation for Tesla, as most of its competitors in the solar panel production business don’t make home batteries, which allow energy absorbed by solar panels to be stored for use at night or other times when sunlight is not available — or when electricity prices are high. In its 2017 fourth-quarter earnings report, Tesla said demand for the Powerwall exceeded the company’s ability to produce it. In its first-quarter earnings report this year, Tesla said that despite installing “a record number” of Powerwall systems during the quarter, its backlog grew. Tesla declined to comment on what that number was exactly. Current and former salespeople told Business Insider they were given shifting timelines, ranging from two to 12 months, for when the Powerwall would be available for installation. The most commonly cited timeline, around six months, was rarely met, former and current employees said. Customers were more likely to wait over a year to receive their Powerwalls, sources said, and some would cancel their orders when installation timelines changed. “I hated when I sold a Powerwall because I knew I really didn’t know when they were going to come in,” a former salesperson said. In addition to providing uncertain delivery timelines, former salespeople said Tesla eliminated the commission they would receive for selling a Powerwall, which further decreased their desire to sell it. Tesla declined to comment on the timelines it has given salespeople for Powerwall deliveries, the number of cancellations it has received for the Powerwall, or its commission structure for energy salespeople. In May 2017, Tesla said solar roof installations would begin that summer, but the first installations for customers who weren’t Tesla employees began in April 2018. Tesla’s solar roof— which consists of a series of solar panels that resemble roof tiles and are meant to cover a customer’s entire roof — is a major selling point for the company. It was designed to be more aesthetically pleasing than typical solar panels and more durable than traditional roof tile materials like clay, slate, and terra cotta. Tesla began taking reservations for the solar roof in May 2017, but the company has failed to give salespeople a clear, consistent timeline for when it will be available, sources said. In May 2017, Tesla said installations would begin that summer, but the first installations for customers who weren’t Tesla employees didn’t begin until April 2018. Current and former salespeople said they either were instructed or chose to avoid talking about the solar roof with customers due to uncertainty about its availability and the fact that they would receive little or no compensation for getting a customer to reserve one. Tesla declined to comment on how it has communicated with salespeople about delivery timelines. A Tesla representative told Business Insider that salespeople in its stores do not actively sell the solar roof, but can help customers make a reservation for one as the company ramps up solar roof production at its factory in Buffalo, which it operates with Panasonic. In its first-quarter earnings report this year, Tesla said it anticipated a significant increase in solar roof production during the second half of the year. A Tesla representative said the company was ahead of its hiring commitments for the Buffalo factory, which employs over 600 workers, but declined to comment on its hiring plans for the rest of the year. In May, Panasonic said it wanted to hire 80 new employees for the factory, The Buffalo News reported. If you’ve worked for Tesla and have a story to share, you can contact this reporter at mmatousek@businessinsider.com. Get the latest Tesla stock price here. Internal documents reviewed by Reuters show Tesla’s plans to shutter 13 or 14 solar installation facilities, according to two different lists. Reuters reported that nearly 60 installation facilities remain open. The development follows news of Tesla’s reorganization, including a move to cut 9% of its employees and to not continue its partnership with Home Depot for residential solar sales. While the electric vehicle manufacturer tries to meet its production targets for its latest luxury sedan, company statements maintain that the solar operation — obtained through its acquisition of SolarCity in 2016 — remains important to Tesla. “Our energy products are critical to our mission to accelerate the world’s transition to sustainable energy, and we continue to expect that Tesla’s solar and battery business will be the same size as automotive over the long term,” said a Tesla spokesperson. As Tesla continues to pursue sales of its solar products in its own stores, Home Depot will continue a partnership with Sunrun, Reuters reported. As direct competitors, Sunrun and SunPower have not seen the same declines in solar as Tesla, according to a recent analysis from the Motley Fool. The two developers have grown their residential solar business and increased their market share while Tesla plans for continuing layoffs. Residential solar installations are expected to remain stable this year, following a 15% decline in 2017, according to a new assessment from the Solar Energy Industries Association and Greentech Media analysts. The residential sector “shows some signs of improvement over 2017,” while non-residential solar installations were off by more than a third, quarter-over-quarter. It’s unclear what impact the solar tariffs levied by the Trump administration will have on installed capacity in the United States, particularly given solar’s falling costs. Details of how many employees will be affected by the solar facility closures remain unclear. Reuters reported that SolarCity offices in California, Maryland, New Jersey, Texas, New York, New Hampshire, Connecticut, Arizona and Delaware were targeted for closure. Based on Tesla’s comments, cuts across its solar sector will be seemingly on par with the 9% cuts across the company. Elon Musk@elonmuskReuters reported that the Home Depot partnership accounted heavily for its solar panel sales. Tesla plans to expand in-store access to its SolarCity panels, which the company previously stated as being available in over 90 of its U.S retail locations. “Over the past couple of quarters, we have increased efforts to sell energy generation and storage systems in Tesla stores,” the company wrote in its Q1 shareholder letter this year. The Internal Revenue Service (IRS) issued guidance on Friday, establishing that solar developers who invest at least 5% of the total expected installation cost of a project by the end of 2019 will qualify for a 30% investment tax credit (ITC). The 2015 law that established the credit did not specifically define what qualifies as beginning construction on a project, to the consternation of the solar industry. The new guidance specifies that developers have four years to begin a project to qualify for the ITC, which then begins to wind down from 30% to 10% based on the construction and service dates of the project. The notice also specifies the deadlines and qualifications for other types of energy properties that qualify for a tax incentive, including small wind projects, fuel cell power plants, geothermal heat pumps and more. “With this notice, IRS sent a strong signal to investors while giving developers clear criteria on par with other renewable technologies,” Liam Donovan, a principal at the law firm Bracewell LLP, told Utility Dive via email. The guidance has been received favorably as it assures the entire solar supply chain, according to Dan Whitten, vice president of communications at the Solar Energy Industries Association (SEIA). “If you’re making manufacturing plans, now you know what the policy’s going to be going forward. The developers are now cleared up on this,” Whitten told Utility Dive. Developers breaking ground or making the 5% investment in the installation by 2020 have until the end of 2023 to bring the project online in order to qualify for the highest tax incentive (30% ITC). According to a Credit Suisse Group AG analyst note, this is particularly useful for developers that are affected by the solar tariffs imposed by the Trump administration, intended to stimulate domestic solar manufacturing. “The news is positive for utility scale solar developers who can now avoid solar tariffs imposed on imports through 2021, procure a majority of their solar panels in later years, and still qualify for the higher tax credits,” analysts at Credit Suisse Group AG wrote, according to Bloomberg. There are too many factors to estimate if the uncertainty of the guidance led to curtailment of solar development, Whitten said. “In the absence of this commence construction guidance, tax equity partners were growing cautious about project risk,” SEIA CEO Abigail Ross Hopper, said in a statement. In March, the IRS released a private letter ruling that a residential energy storage facility may qualify for the 30% solar ITC if it is charged completely by an onsite solar array. The ruling only applied to the undisclosed case addressed in the private letter, but it indicated the agency’s views on residential storage eligibility for the credit. ATTENTION: FISCAL YEAR 2018 FUNDING WILL BECOME AVAILABLE ON JULY 1, 2017. INFORMATION DETAILS CAN BE FOUND BELOW AND UNDER THE “ADDITIONAL GUIDELINES” TAB. IN ADDITION, REGULATIONS FOR THIS PROGRAM ARE CURRENTLY BEING DRAFTED. COMMENTS REGARDING PROGRAM REGULATIONS MAY BE SUBMITTED TO THE MARYLAND ENERGY ADMINISTRATION (MEA) PROGRAM MANAGER WHOSE CONTACT INFORMATION IS AVAILABLE UNDER THE “ADDITIONAL INFORMATION” TAB BELOW. MEA is working with Marylanders to expand the State’s growing electric vehicle recharging infrastructure through the Electric Vehicle Supply Equipment Rebate Program 2.0.Through the program, residents, governments and businesses can acquire a state rebate for purchasing or installing an electric vehicle charging station, known as Electric Vehicle Supply Equipment (EVSE). In order to receive these rebates, eligible participants must apply with MEA, which will issue rebates on a first-c​ome, first-served basis. The EVSE Rebate Program 2.0 provides funding assistance for costs incurred acquiring or installing qualified electric vehicle supply equipment on or after July 1, 2017, but before June 30, 2020. Applications must be received by MEA within 6 months of the date that the equipment or install expenses were incurred. The EVSE Rebate Program 2.0 is a new program unique and separate from previous funding opportunities, established by legislation under the Clean Cars Act of 2017. As such, funding mechanisms established under previous programs will not impact this new program. EVSE equipment or installation costs incurred prior to July 1, 2017, along with applications submitted to previous funding programs, are ineligible for funding under the EVSE Rebate Program 2.0. Please note: Capacity is limited, and you must register and pay registration fees, not later than June 30, 2018. The event is taking place in a secure facility, and you must register in advance; we will not conduct onsite registration for this event. If you are a member of the Network and and like your organization’s logo on the conference materials, please email your logo to the Secretariat at agoacsonet@democracy.org not later than June 15, 2018. The 4th Annual AGOA Spring Conference took place April 18 -19, 2018 in Washington, DC, at the Embassy of the Federal Republic of Nigeria, and on Capitol Hill. The conference focused on President Trump’s policy on Africa; and included a review of the Administration’s recent visit to Africa; trade numbers for AGOA over the past twelve months under the Trump administration; and discussed the opportunity that bi annual AGOA Utilization Strategies offer eligible Sub-Saharan African (SSA) countries for increasing exports and advancing economic cooperation under AGOA. 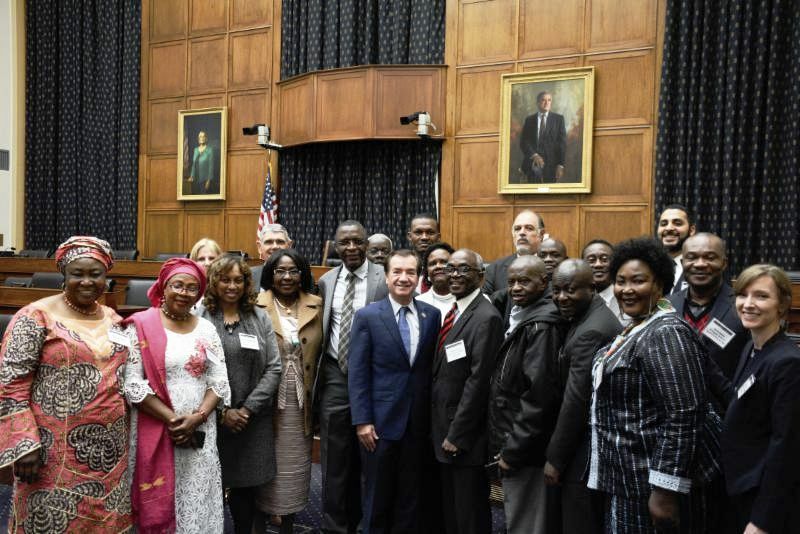 A highlight of the event was a visit by members of the AGOA CSO Network with Congressman Ed Royce, Chairman of the House Foreign Affairs Committee and a Congressional Exchange on the legislative agenda for AGOA on April 19thon Capitol Hill. Last chance to register! Registration closes at 1:00 pm today for the Institute for Youth Development’s conference this Friday, June 22, 2018. This one-day conference will help youth development practitioners working in out of school time programs across the District. Key influencers in the field are prepared to deliver valuable information to benefit attendees looking to improve their programming. The keynote speaker is Karen J. Pittman, President and CEO, Forum for Youth Investment, a national nonprofit, nonpartisan “action tank” that combines thought leadership on youth development, youth policy, cross-system/cross-sector partnerships and developmental youth practice with on-the-ground training, technical assistance and support. Limited seats and time remain to register! The United Way of the National Capital Area (United Way NCA), is seeking volunteer grant proposal reviewers to assist in reviewing two separate Request for Proposals (RFP) to award close to $2.5 million. United Way NCA is seeking a diverse group of people to review the two School Year grant competitions on behalf of the Office of Out of School Time Grants and Youth Outcomes. Please note: if you are a grant applicant, you are still eligible to review for the other grant competition. For more information on how to serve as a reviewer, please contact Abby Bonder at abonder@uwnca.org. Washington, DC – The Commission on Out of School Time Grants and Youth Outcomes (OST Commission) will hold a public meeting on Thursday, June 28, 2018 from 6:00 pm to 7:30 pm at One Judiciary Square, 441 4th Street NW, Room 1107 South. The OST Commission will vote to adopt the bylaws for the OST Commission and discuss the strategic plan. In addition, the Commission will hear updates from the Office of Out of School Time Grants and Youth Outcomes. Individuals and representatives of organizations who wish to comment at a public meeting are asked to notify the OST Office in advance by phone at (202) 481-3932 or by email at Learn24@dc.gov. Individuals should furnish their names, addresses, telephone numbers, and organizational affiliation, if any, and if available, submit one electronic copy of their testimony by the close of business on Monday, June 25 at 5:00 pm. Come join a variety of DC government agencies on Saturday, June 30, 2018 from 8:00 am – 1:00 pm at RFK Stadium for a day full of interactive activities. For more information, please click here. Kids, teens and adults can win prizes for reading this summer by participating in the 2018 DC Public Library Summer Challenge. Read 20 minutes each day to keep your mind active and engaged over the summer. To learn how to participate, please visit their website. This is a weekly newsletter full of grant opportunities. The Office of Out of School Time Grants and Youth Outcomes, located in the Office of the Deputy Mayor for Education and informed by the Mayor’s Commission on Out of School Time Grants and Youth Outcomes, leads the Learn24 network. Email Learn24@dc.gov if you have information to share with the field. This offering is entirely voluntary and is open to all qualified Pepco residential customers in Maryland with a plug-in vehicle. To participate, your vehicle must be registered in Maryland. A whole house time-of-use rate (Pepco SOS customers only): This plan applies to your entire house, including your vehicle. If you choose to shift your home energy use to off-peak hours (after 8 p.m.), you may achieve additional savings. To apply please click here. ​An R-PIV Rate (offered only to ​Pepco SOS customers) applies to the electricity used for the entire house, including the vehicle. Therefore, it is important to change behavior and use more energy during off peak times (Monday – Friday, 8:00 p.m. – 12:00 p.m and all hours on weekends)​ in an effort to decrease energy costs. What are the qualifications for the offering? ​What incentives are available to customers? ​I am a third party customer. Can I get the R-PIV rate? ​No. In order to get the R-PIV Rate you MUST be a ​Pepco SOS customer. The experiment is the latest sign of China’s desire to innovate in, and dominate, the increasingly lucrative and strategically important market for renewable energy. The country already produces three-quarters of the solar panels sold globally, and its wind-turbine manufacturing industry is also among the world’s largest. The potential appeal of solar roads — modified solar panels that are installed in place of asphalt — is clear. Generating electricity from highways and streets, rather than in fields and deserts packed with solar panels, could conserve a lot of land. Those advantages are particularly important in a place like China, a heavily populated country where demand for energy has risen rapidly. Because roads run through and around cities, the electricity could be used practically next door to where it is generated. That means virtually no power would be lost in transmission, as can happen with projects in outlying locations. And the land is essentially free, because roads are needed anyway. Roads must be resurfaced every few years at great cost, so the installation of durable solar panels could reduce the price of maintenance. Solar roads could also change the driving experience. Electric heating strips can melt snow that falls on them. Light-emitting diodes embedded in the surface can provide illuminated signage to direct drivers to exits and alert them to construction and other traffic hazards. Now, such roads are finally becoming viable. Prices have fallen drastically in recent years — thanks in large part to soaring Chinese production, a solar panel costs a tenth of what it did a decade ago. Road builders in China even want to design solar roads that can wirelessly recharge electric cars running on them, emulating a recent American experiment. China’s leaders in solar road development are Pavenergy and Qilu Transportation. The two companies are working together here in Jinan, in Shandong Province, with Pavenergy making panels for Qilu, a large, state-owned highway construction and management company that operates the highway. 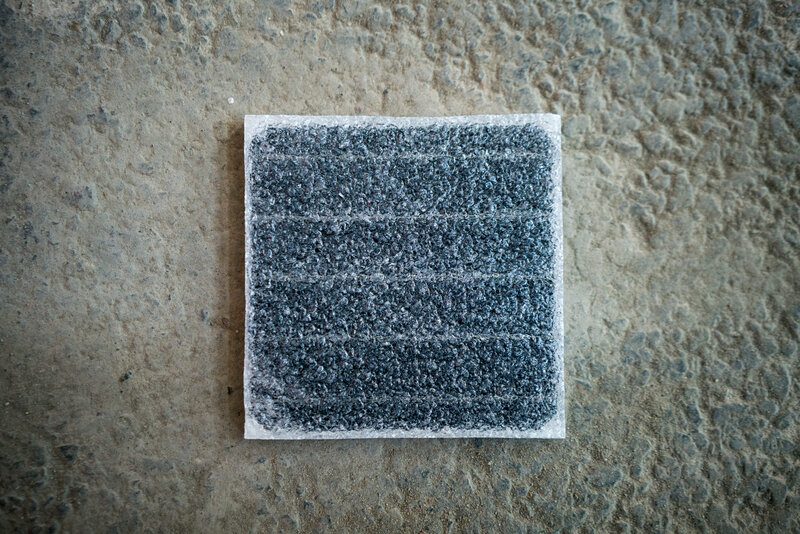 The surface of these panels, made of a complex polymer that resembles plastic, has slightly more friction than a conventional road surface, according to Zhang Hongchao, an engineering professor at Tongji University in Shanghai. Professor Zhang, who helped develop Pavenergy’s road surface, said that the friction could be adjusted as needed during the manufacturing process to ensure a level of tire grip equal to that of asphalt. The location of the solar road here, on a long curve at the bottom of a hill, was not Pavenergy’s first choice. The site was chosen because of its proximity to an electricity substation, ensuring that it would be connected to the grid. China is adding solar and wind energy sites so fast across the country that power generation projects farther from substations sometimes face delays of years in getting connected. The main Western rival to Pavenergy and Qilu is Colas, a French road-building giant that has developed 25 experimental solar roads and parking lots, mostly in France but also in Canada, Japan and the United States. The biggest of Colas’s solar sites, a country road in Normandy that opened a year and a half ago, has only half the surface area of the new solar highway in Jinan. Colas has been leery of putting solar panels on high-speed roads like the Chinese highway because of safety concerns; Professor Zhang said the panels were completely safe. Still, a litany of outstanding challenges means the wide deployment of solar roads is a long way off. For one, they are less efficient than rooftop solar panels at converting the sun’s light into electricity. They lie flat, and are intermittently covered by vehicles, so solar panels on a road produce only around half the power that rooftop ones tilted toward the sun do. Solar roads are also more expensive than asphalt. It costs about $120 a square meter, or about $11 a square foot, to resurface and repair an asphalt road each decade. By comparison, Pavenergy and Colas hope to be able to bring the cost of a solar road to $310 to $460 a square meter with mass production. Panels on a highway would likely need to be replaced less often than asphalt, Professor Zhang said. 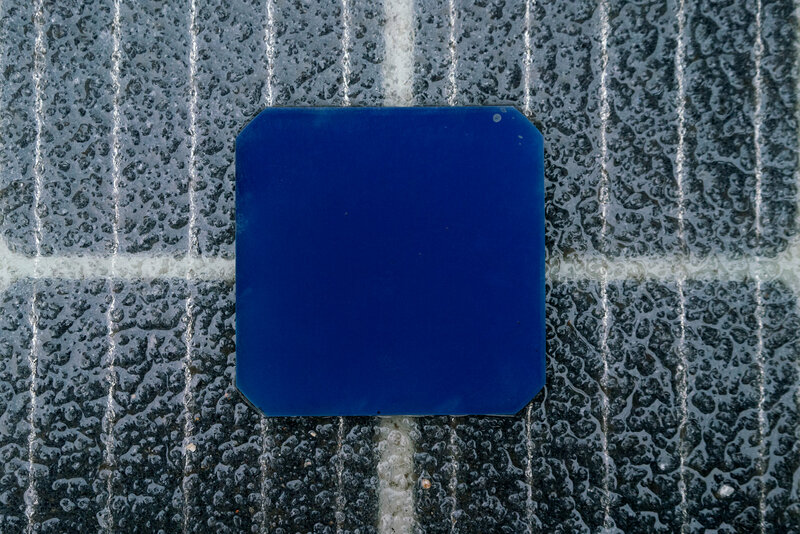 And a solar road can produce about $15 a year worth of electricity from each square meter of solar panels. So it could roughly pay for itself, compared with asphalt, over about 15 years. Less clear is whether the panels would be able to take the pounding of millions of tires each year for more than a decade, or whether they might be stolen. Several square feet of solar panels disappeared less than a week after they were installed here in late December, raising worries of theft or even industrial espionage. Local police officers, facing criticism for not providing better security, said that the panels must have been crushed into tiny pieces and scattered by heavy trucks. Pavenergy declined to comment. In the United States, installing solar roads is more complicated. With the exception of some bridges and sections of interstate highways, American roads tend to be built with a lot of asphalt, but with less concrete underneath than roads elsewhere, said Kara M. Kockelman, a transportation engineering professor at the University of Texas. Still, executives here are hopeful. They say that the technology is ready and that they are not concerned even by the complications of American highway construction. ALERT! Stand with DC Clergy and residents who are fighting displacement by way of predatory water fees. Did you know that the CRIAC (Clean Rivers Impervious Areas Charge) fee has increased 2,000% over the past few years? Now, some churches are being forced to pay $2,000/month for this fee alone! Cemeteries have been charged as much as $19,000/month! Homeowners are seeing over $60 per month for this fee alone. Failure to pay water bills can cause foreclosure of your property. Many churches and homeowners are at risk. Why is this fee so high? Because the DC government is failing to pay the bill for this massive $2.7 billion DC Water infrastructure project – leaving ratepayers to foot the bill. We are seeking 40 million dollars from the city in the DC budget to pay down the expense, leaving less of the burden distributed to the rate payers. Excessive water bills are threatening our homes, churches, seniors, and all others who may be struggling to live in the city. Several clergy disrupted the DC Council hearing on May 15th in protest of these fees, and this hearing has been scheduled as a result. Please help us send a strong message with your presence! The time is now! Sustainability is preserving what you have in order to make it last as long as you can… Sustainability is important to me, because I am an advocate for the area around me. Bowie State University recognizes the need to reduce the worst impacts of global warming. The University is deeply concerned with the scale and speed of global warming and its potential for large-scale, adverse health, social, economic and ecological effects. Over the course of several years, the institution has updated campus master plans, conducted an environmental audit, and made material investments in infrastructure. President, Dr. Mickey Burnim in 2007 established the Climate Commitment Coordinating Committee (C4) to initiate the development of a comprehensive plan to achieve climate neutrality on campus. BSU has already reduced its carbon footprint by 15% since 2007 and the goal is to obtain carbon neutrality by 2021. Dr. Burnim in 2015 also signed the new Climate Commitment and White House Act on Climate Pledge part of which is the cornerstone to the Paris Climate Agreement. 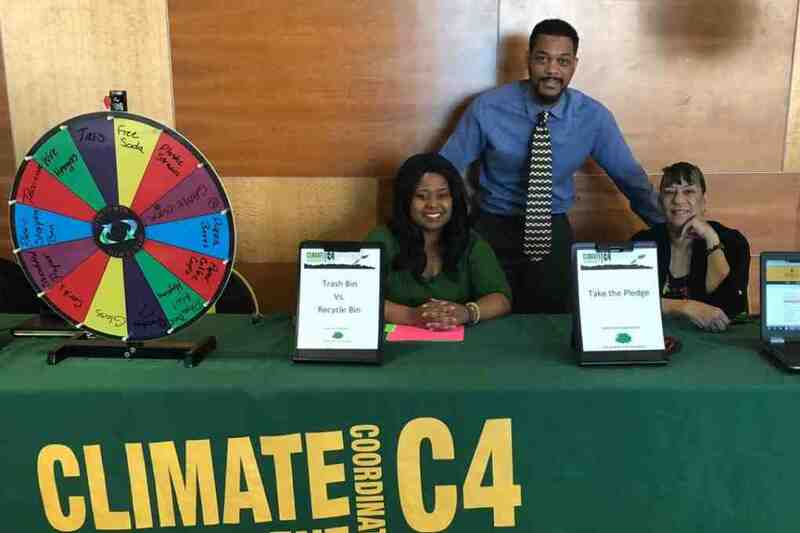 The ongoing vision of Bowie State University’s sustainable programs can also be found on the BSU Climate Action Plan as well as the BSU Sustainability Education Plan. In December 2017, the C4 Chair coordinated the Climate Action Plan Addendum. Part of BSU’s goal is to be conscious of how energy resources are utilized in our buildings. Our first Lucid Energy touchscreen Dashboard is displayed in the Student Center between the Bowie Card Office and the BSU Ticket Office. See real-time data on energy utilization in the Student Center here: Bowie State Student Center Dashboard. An energy dashboard will soon appear in the CNSMN building. 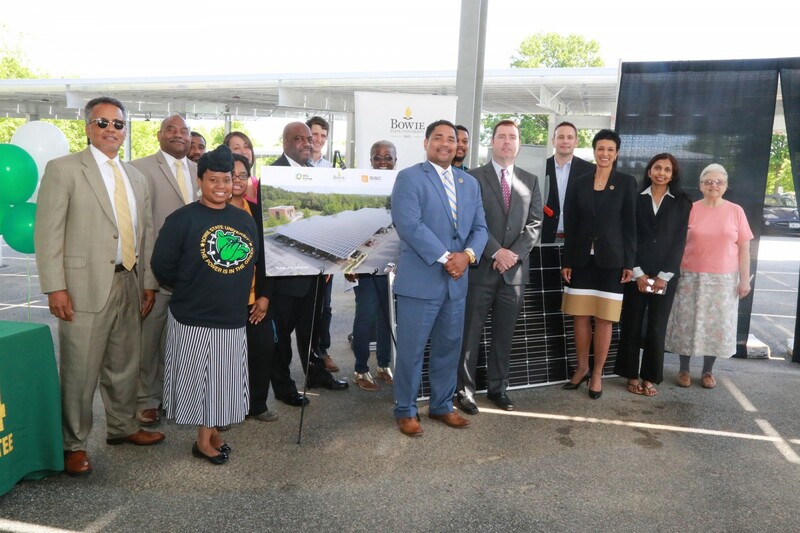 On Monday, May 21, 2018, on a beautiful spring day under the solar panel canopy of Parking Lot D, the Bowie State University community along with representatives from WGL Energy and SGC Power celebrated the launching of the solar panel system program on campus. During the 11 a.m. program, President Aminta H. Breaux, Michael Atkins, Interim VP of Administration and Finance, Michael Harris, Capital Projects Manager and Jack Hachmann, Director of Commercial Operations from WGL Energy joined with other dignitaries and the campus community to ceremoniously ‘flip the switch’ to activate the university’s solar power system. The system will generate about 10 percent of the campus’s energy needs. The Maryland Energy Administration (MEA) provided a $150,000 grant which enabled the University to partner with WGL Energy in installing a 1.6-megawatt solar power system across four sites of the campus. In addition to the solar canopy in Lot D, there are solar panels on the roofs of Thurgood Marshall Library and the James Physical Education Complex, as well as a ground installment at an open field near the Bulldog Softball field. Two charging stations for electric vehicles were also installed under the Lot D solar canopy as a part of the project. “It is the direction of higher education to utilize alternative forms of energy,” said Michael Harris, BSU capital project manager. 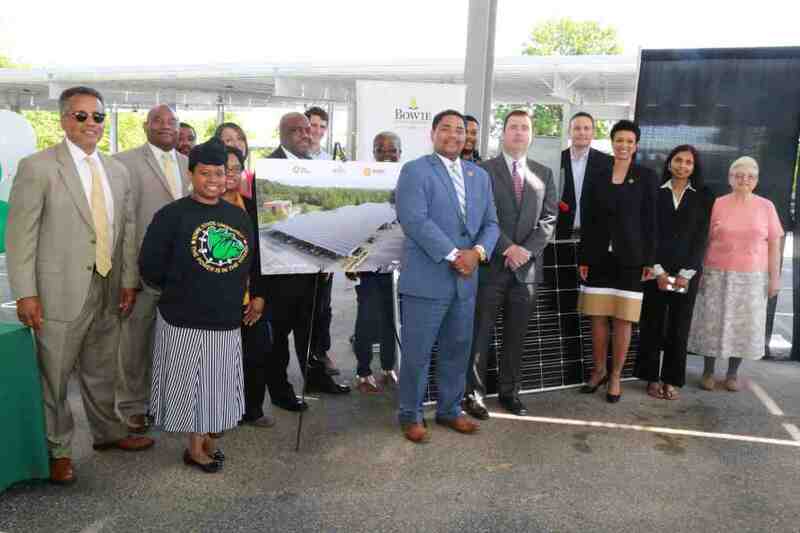 “Bowie State is aligned with the national trend in higher education to implement solar power projects.” President Breaux also acknowledged the work of Dr. Karl Brockenbrough (retired) in spearheading the effort, and the tireless efforts of the BSU’s C4 (Climate Commitment Coordinating Committee) group. The present C4 committee members along with Michael Atkins, Michael Harris, and President Breaux stood behind the switch with WGL representatives for a photo opportunity as President Breaux symbolically flipped the switch from the off to the on position. David Comas of MEA attended as well as BSU TV and local media affiliate, CTV. C4 Chairman Jabari Walker defines the project as an important step in furthering support of the University’s sustainability goals, BSU’s commitment to lowering its carbon footprint, and remaining an institutional leader in environmental responsibility within Maryland and across the globe. The California Energy Commission approved the 2019 Building Energy Code on Wednesday, requiring renewable energy access for all new residential homes in the state starting in 2020. The code includes incentives for energy storage while mandating that the construction of new homes include advanced energy efficiency measures and rooftop solar. The mandate could require between 68 and 241 MW of annual distributed solar buildout, according to ClearView Energy Partners’ research using 2017 data. All told, the new code is meant to save Californians a net $1.7 billion on energy bills, while advancing the state’s efforts to build-out renewable energy, the commission said. This historic revision of building energy codes ensures a large investment in residential rooftop solar and energy efficiency as California pursues its mandate of getting 50% of its energy from renewables by 2030.”The combination of rooftop solar and the option to add energy storage systems as an efficiency compliance credit provides builders with an attractive, cost-effective option to fully electrify homes,” Abigail Ross Hopper, president and CEO of the Solar Energy Industries Association, said in a statement. SEIA worked with the commission for more than two years to develop the new standards.Already, the news has been a boon for solar developers such as Sunrun, Vivint Solar and First Solar. Bloomberg reported a surge in the stock of solar companies after the commission’s decision. In a prior boost for solar, the California Public Utilities Commission (CPUC) had approved its net metering 2.0 rate design in January 2016, to the chagrin of the state’s investor-owned utilities. Utilities asserted that the net metered distributed generation from California’s electricity consumers shifted the costs for the system’s maintenance and infrastructure onto non-distributed generation owners. Research from analysts at ClearView singled out Wednesday’s distributed solar mandate as a possible opening for utilities to argue that California regulators should reconsider the net metering reform proposal. Utilities that objected to the new rate-design “could contend that the introduction of mandated distributed solar sufficiently alters the policy landscape to warrant further review of the compensation levels paid to excess generation,” ClearView said in their report, published ahead of the energy commission’s decision. The updated codes also include new incentives for energy storage: integrating storage in new homes would lower the required size for solar systems. The state has been a leader in incentivizing energy storage. In January, the CPUC moved to allow multiple revenue streams for energy storage, such as spinning reserve services and frequency regulation. California’s Building Standards Commission must also approve the new standards, Associated Press reported. The Butler pig farm includes a range of clean energy technologies, and the state’s cooperatives see its grid integration efforts as a model that can be replicated. According to the United Nations, by 2050, the world’s food production will need to increase 70% to feed a steadily-growing population. That means more farming, and more energy demand to support it. The International Renewable Energy Agency estimates almost a third of the world’s energy is used by the agri-food supply chain. And increasingly, many types of farms, from rice to livestock, are tapping new energy technologies to reduce their carbon footprint and maintain reliability —particularly in areas where the energy supply may be less reliable. It’s not unusual to see a farmer utilizing wind or solar to reduce their energy needs, and at times the energy production can be more valuable than crops. But a growing number of agricultural businesses are going further, embracing grid edge technologies whole hog, if you will. And the fuel mix is often tied to the farm’s primary business. In the United States, perhaps the best known agricultural microgrid is Stone Edge Farm in Sonoma, Calif. Along with Bordeaux-style wines, they also produce olives, eggs, herbs and almost a megawatt of energy to fuel operations. The farm’s microgrid is extensive, essentially a laboratory for grid edge ideas: it utilizes a half-dozen storage technologies, and during the California wildfires was able to island itself for more than a week. Colorado-based Husk Power Systems developed systems in India to generate electricity from gasified rice husks that are often discarded by farmers, to power local communities. On the island of Hawaii, the North Kohala Microgrid Project uses wind to power water pumping, a frequent need of farmers, for a range of local agricultural operations. And just last week, in North Carolina, a microgrid was commissioned at the Butler Quality Pork and Renewable Energy Farm in Harnett County, and connected to the South River Electric Membership Corporation (SREMC). The system, which is member-owned and controlled, integrates renewable biogas from swine waste, solar generation and energy storage, and can power 28 nearby homes for up to four hours at peak demand. The Butler microgrid is unique in many ways: it was privately built by a conservation-minded local farmer, and then later connected to the cooperative’s grid. It remains under control of the farm, though in a later phase of development it will be transferred to SREMC. General Motors and Honda announced a deal to develop next-generation electric-battery technology. GM will ultimately supply Honda with batteries for the North American market. The deal comes after GM and SoftBank revealed a $3.35 billion investment in GM’s Cruise self-driving division. GM intends to bring 20 new EVs to market by 2023. General Motors might be over 100 years old, but the car maker isn’t slowing down in its march to the future. After announcing a $3.35-billion investment in its Cruise self-driving division by Japan’s SoftBank and GM itself, the company on Thursday said that it has struck a deal with Honda to develop and supply electric-vehicle batteries. “This new, multiyear agreement with Honda further demonstrates General Motors” capability to innovate toward a profitable electric portfolio,” vice-president and product czar Mark Reuss said in a statement. “GM’s decades of electrification experience and strategic EV investments, alongside Honda’s commitment to advancing mobility, will result in better solutions for our customers and progress on our zero emissions vision.”In the arrangement, GM will supply Honda with advanced battery packs. “The next-generation battery will deliver higher energy density, smaller packaging and faster charging capabilities for both companies’ future products, mainly for the North American market,” GM said in a statement. GM has committed to bringing 20 new all-electric vehicles to market by 2023. That effort will require a lot of batteries, so the carmaker is logically partnering with Honda because the automakers have joined forces before, to develop fuel-cell technologies. The announcement also signals GM’s intention to create new business opportunities. The new Cruise investment has given that division an $11.5-billion valuation within GM, whose current market capitalization is about $60 billion. Now GM has decided that if better batteries are to be built, the GM — with an assist from Honda — will build them. And in the process create a new line of revenue and profits. Daimler’s Freightliner eCascadia will have half the range of a Tesla Semi. Daimler unveiled two electric trucks on Wednesday, one of which will compete directly with Tesla‘s semi-truck, the Semi. The Freightliner eCascadia will have a range of 250 miles and be able to receive 200 miles of range from a 90-minute charge. Tesla’s Semi will have double the range of the eCascadia, 500 miles, and be able to receive up to 400 miles of range from a 30-minute charge. Daimler unveiled two electric trucks on Wednesday, one of which will compete directly with Tesla’s semi-truck, the Semi. The heavy-duty Freightliner eCascadia will have a 550 kWh battery pack with a range of 250 miles and produce 730 horsepower. The vehicle will be able to receive 200 miles of range from a 90-minute charge. Tesla’s Semi will have double the range of the eCascadia, 500 miles, and be able to receive up to 400 miles of range from a 30-minute charge. It will also be able to accelerate from 0-60 mph in five seconds without any cargo and in 20 seconds while carrying 80,000 pounds of cargo. “If Tesla really delivers on this promise, we’ll obviously buy two trucks — one to take apart and one to test because if that happens, something has passed us by,” he told the publication. He also implied that the Semi’s specs would break the laws of physics. On Wednesday, Daimler also revealed the medium-duty Freigthliner eM2, which is designed for local and last-mile delivery services and will have a range of around 230 miles. Daimler will give 30 prototypes of the electric trucks to early customers by the end of the year, and will begin series production for the eCascadia and eM3 in 2021. LETTER FROM MAYOR MURIEL BOWSER ON Sustainable DC 2.0 Sustainable DC 2.0. Tell Congress to extend the federal EV tax credit! MD is moving to 100% clean electricity by 2040.Thank your legislators! Will FERC trample state and local authorities in DER rulemaking?